LeBron James hit two free throws with 7.8 seconds left and finished with 35 points, 17 assists and seven rebounds to lead the host Cleveland Cavaliers to a 132-129 win over the Eastern Conference-leading Toronto Raptors on Wednesday. Kevin Love scored 23 points, including a 3-pointer with 27.5 seconds left to put Cleveland up 128-124, and added 12 rebounds. George Hill had 22 points on 10-of-11 shooting for the Cavaliers, who won their third straight and posted a fourth victory in five games. Kyle Lowry had 24 points and DeMar DeRozan had 21 to lead the Raptors, who came into the game winners of 19 of 21 but have now lost two of three. Dwight Howard totaled 32 points and 30 rebounds while Kemba Walker converted the go-ahead three-point play with 18.3 seconds remaining as visiting Charlotte overcame a 23-point deficit and stunned Brooklyn. Howard had the NBA's first 30-30 game since Kevin Love had one in November 2010, and only the second since Moses Malone achieved the feat in 1982. Howard had 26 points and 20 boards after halftime and nine points and eight rebounds in the fourth quarter, when Charlotte outscored Brooklyn 36-18. Howard shot 10 of 17 from the floor and made 12 of 21 free throws. He tied a career high with 11 offensive rebounds. The 30 rebounds set a Hornets record. LaMarcus Aldridge scored 27 points and hit two consecutive baskets during a pivotal stretch of the fourth quarter as San Antonio easily handled visiting Washington. The win was a season-high fifth straight for the Spurs, who just a few weeks ago were outside of the playoff picture and in jeopardy of seeing an end to their run of 20 straight years in the postseason. All that changed with a perfectly timed stint at home, the current winning streak and the return to health of Aldridge, who has now been the team's leading scorer 50 times in the 64 games he has played this season. San Antonio is now tied for fifth in the Western Conference with the New Orleans Pelicans, a half-game behind the fourth-place Oklahoma City Thunder. DeAndre Jordan had 25 points and 22 rebounds as visiting Los Angeles snapped a four-game losing streak by beating Milwaukee, which saw All-Star forward Giannis Antetokounmpo leave the game in the second quarter after turning his right ankle. Austin Rivers scored 22 points, Lou Williams had 19 and Tobias Harris added 18 for the Clippers. Jordan's latest big rebounding outing -- he has 13 games of 20 or more this season -- helped the Clippers amass a 47-33 edge on the boards. Milwaukee lost for the ninth time in the past 13 games. Khris Middleton paced the Bucks with 23 points, and Jabari Parker added 20 points. JJ Redick, Marco Belinelli, Dario Saric and Robert Covington scored 15 points apiece, and Philadelphia cruised past depleted Memphis in Philadelphia. The Sixers won their fourth in a row and reached the 40-win plateau for the first time since the 2010-11 season. Philadelphia needs two more wins to finish above .500 for the first time since the 2004-05 campaign. The Grizzlies, who have dropped 16 consecutive road games, got 18 points from Wayne Selden. Miami's high-flying offense soared over visiting New York as the Heat won for the ninth time in their past 10 home games, including six straight, and improved to 22-13 at home. Tyler Johnson and Kelly Olynyk led Miami with 22 points each, with Olynyk adding a career-high 10 assists. Wayne Ellington had 16 points, Justise Winslow 15, Goran Dragic 14 and Josh Richardson 12. The Heat, seventh in the Eastern Conference playoff race, have averaged 115 points per game since the All-Star break. They scored a franchise-record 149 in their double-overtime win over the Denver Nuggets on Monday. Anthony Davis had 28 points, 13 rebounds and five blocks as New Orleans held off visiting Indiana. 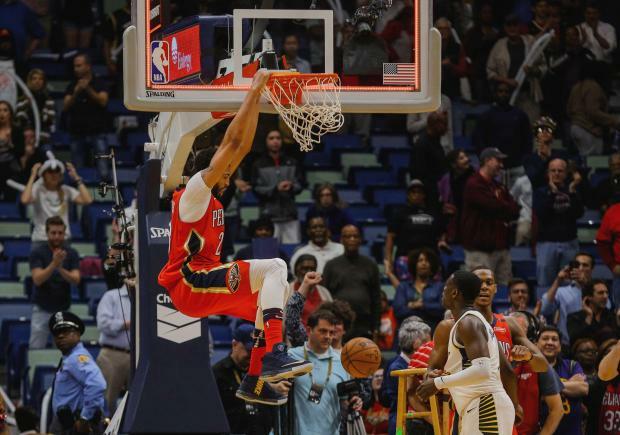 E'Twaun Moore added 23 points, Nikola Mirotic scored 15 and Jrue Holiday, returning from a one-game absence due to the flu, scored 10 as the Pelicans won their third consecutive game. Victor Oladipo scored 21, Myles Turner had 13 points and 10 rebounds, Darren Collison added 11 points and Trevor Booker 10 to lead the Pacers. The game was rescheduled from Feb. 7 when a leak in the Smoothie King Center roof made the floor unplayable. Scoring 113 points in the first three quarters, Denver moved within 1 1/2 games of the Utah Jazz for the final playoff spot in the Western Conference by embarrassing host Chicago at the United Center. Seven players scored in double figures for Denver, which improved to 39-33 with 10 games remaining. Paul Millsap led the balanced attack with 22 points, going 8 of 9 from the field, and he also grabbed a team-high eight rebounds. Nikola Jokic added 21 points on 9-of-11 shooting, seven rebounds and five assists in only 24 minutes, while Wilson Chandler chipped in 19 points and five rebounds for the Nuggets. Cristiano Felicio scored a team-high 16 points for the Bulls.